3D in the Home: How Close are We? 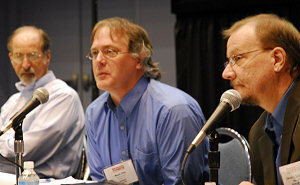 A discussion forum was held at the 2007 Stereoscopic Displays and Applications conference. This page provides a transcript of that event. (SS) Steven L. Smith, CEO, VREX Inc.
LL: We have a panel discussion on “3D in the home, how close are we” and I think [this] is code for 3D Television in the home because obviously we have 3D at home because I’m able to move about my home and if it were only 2D, I wouldn’t be able to go anywhere. I would be stuck to a plane. So we have here on the panel Brett Bryars who is from the United States Display Consortium. Art Berman who represents himself and his parents have disowned him as well as every company he’s worked for. [Lenny smiles] And then we have Mark Fihn who is in charge of several newsletters including an excellent newsletter about 3D displays and at the end we have Steven Smith who perseveres with VRex. So I am, what I am going to do is, we can start with Steve and just move down the panel and we can just have each one of these guys say what they think about the possibilities of 3 dimensional television in the home and it’s a chance to be a seer to look into the future, possibly the short term future. Steve why don’t you begin. SS: Thank you Lenny for the introduction. When this initial topic came up it went thru a number of different versions of names and what’s the topic going to be about. But I think it was good that it settled on the issue of what could potentially be the broadest market for a technology that all of us hold so near and dear that we’ve been coming to these meetings for the [last] 19/18 years. I think as you look at trying to break this up, and I’m kind of sitting in this seat from a couple of different vantage points, managing a company that has stereoscopic products as well as having worked in a research laboratory at the media lab, developing prototypes for autostereoscopic and stereoscopic displays, I think you can start to look at this in an interesting way. First off there are workable solutions on the hardware side already available and I’m sure a number of different panelists are going to add viewpoints that are very pertinent in that aspect. But with time-sequential displays like shutter glass based displays with DLPs you have very workable high quality, what you want to call full resolution capable systems. You have some systems that are getting to be available in the spatially multiplexed area. Philips and LG are producing products that, for an early adopter are beginning to show potential. And autostereoscopic display, when you look at other types of technology related to that, they’re getting closer. But I would maybe want to position the question as “Are they close enough yet?” On the content side, and this is where you start to look at a much more complex arrangement of what needs to be the toolset. You can kind of, I think substantiate that REAL D and Lenny’s group has created a platform where there is a product delivery pipeline for CG developed content that’s already getting out there and potentially that could become a basis of content that would be available for home systems. But as soon as you start to look at other areas, one being 2D to 3D conversion which would open the biggest library of existing content to be potentially replayed through a home system. And you add perhaps 2D to 3D conversion as maybe one methodology to approach the issue of live content streaming, there I still feel that the jury is still out. Is there adequate technology for that? Especially when you have to look at the fact, and I think Janusz brought this up indirectly, these are large format systems that are going to be implemented. People aren’t going to be interested in doing 3D in the home on a 20” monitor or 24” monitor. They’ve invested in 50/65”, we’re seeing companies like Samsung and LG coming out with 72” and 100” scale systems that are 1920x1080i and p. And the 3D has to work at that level, at that scale for an adopter to say, yea, this is ready for me. And there is an interesting set of issues that are not as well resolved. Are you going to do 2 channel capture and a depth map and leave all the decoding on the receiver side? And they will set, do I have a 2 view system, do I have a 6 view system or a 9 view system? And also issues related to compression and streaming. There, I think you have less of a clearly defined parameter set that gets you into that. LL: Thank you. Lets move down the food chain here, Mark. MF: Hi, my name is Mark Fihn. For those who don’t know me I publish a series of newsletters about the displays industry. One of them is specifically about 3D displays. I sit on this panel, I must confess, a little awkwardly because my wife and I decided several years ago that Television, whether it was standard definition or high definition or 3D or any other form generally doesn’t come with the content quality that we want to have in our home. So I don’t have television in my home. I write about it all the time but until the content providers come up with something that’s worth watching I’ve made the decision not to watch television. No don’t be mistaken, I watch lots of films and I have TV devices in my home but the specific question of 3D television is a little bit awkward for me to address simply because it doesn’t matter to me yet. Now that’s copping out a bit because I actually believe that 3D is going to be in the home and it’s going to be in the home in a big way. I just don’t see it happening initially with TV. I see it happening probably with gaming or maybe hand held sort of devices. But we’ll go into that some more. LL: Well Art, let’s hear your views. AB: Actually I might mention that part of the reason I was selected for the panel is that I am currently working on behalf of Insight Media in preparation of a 3D industry report on the state of the union in 3D. And in preparing for the session today, I created a mental list of all the positive business and technological reasons why 3D would succeed in home video and also the difficulties and problems as to why it would not. I found myself sort thinking in terms of on one hand it will and on one hand it won’t. And it occurred to me that to get the most effective panel discussions you really should hire engineers with only one hand to make the presentation. I’ve always looked at video in the home as sort of the Holy Grail for 3D. The ultimate success will [be] when homes have 3D televisions. And I guess my bottom line opinion is that right now Television is digesting a lot in going to high definition television and large screens and all of the new digital formats and also with video on demand. And that people are buying new and very expensive TVs for the home right now. They are not going to want to buy another one. And if 3D isn’t integrated into the TVs that they are buying now, it will be many years before they choose to buy another one with 3D capabilities. LL: Thank you Art and now we’ll move to Brett. BB: Thanks Lenny. My name is Brett Bryars, I’m from the US Display Consortium. I’m new to the 3D industry. I’m not new to displays. I’ve been working in the display industry for 20 years; probably the past 12 years have been primarily in consumer television space. So my perspective today on this panel is really coming from the consumer TV side. In terms of 3D, you know, I can see 3D coming into the home maybe in 4 different places. One is going to be in your pocket. That might be your mobile, it might be a PDA, it might be your kids’ PSP or whatever you can fit in your pocket. Second place is going to be in your office. You are going to have a computer with a monitor. The third place might be in your home theater, projection systems. And the fourth place is going to be in your living room. And that’s where you have your standard TV. I can envision 3D coming into the home in the first 3 spaces, you know in some kind of timeframe, the last one where it’s in your living room, that’s where I have a lot of trouble seeing 3D TV really taking a big space for quite a long time. LL: Thank you. I would like to point out that this is an audience participation session and if you’ve got questions or comments, we’d love to hear them. Because it’s a big room, it’s really hard to hear people, so Neil Dodson who’s dressed in purple, we asked him to wear purple, so that we would be able to find him. If you’ve got a question or comment, you just come up to Neil and once again he’s the man with the purple tie and the purple shirt. So, just head on up there. So I know that the work that my company and I are doing was mentioned. REAL D is a company that licenses or leases stereoscopic projection equipment for DLP cinemas. We have a number of theaters now in the world and there’s a steady stream of content that will be produced by the major studios, not just CGI, there will be live action movies from Fox, but often movies that are described as tent pole movies, big movies [that] are a combination of CGI and live action. A couple of weeks ago I was looking at green screens of “Journey to the Center of the Earth” and looking at actors who are against a green background screaming at non-existent monsters, it’s very interesting. So there’s going to be a bunch of 3D movies coming especially in 2008 we’ll see a lot of 3D movies. We’ve also tested these movies on smaller screens. One of the things that people have asked me about was how do they look when they are shot for 40 foot screens, how do they look on a 40” screen? And honestly they look perfectly fine. So it’s a surprising answer, but the eye-brain is able to adjust. So content which is produced for a large screen will look OK on a small screen. Vice versa it may not work because there are issues with parallax. The introduction of the stereoscopic television medium for the home is going to be very complicated. What REAL D was able to accomplish in terms of creating a stereoscopic cinema as I believe a viable business, there are only 25 people at REAL D, but we have industry contacts. The motion picture business is a relatively instrument business so a company in Beverly Hills can have relationships with all the major studios, talk to the directors, producers, studio heads, heads of distribution and promulgate the idea and market it in a very nice theater. We have a theater that used to be Kirk Kerkorian’s theater in a building that was built for MGM so we can bring people by and show them what we’re doing. We’ve also setup a number of theaters and screening rooms in the Los Angeles area because Los Angeles is a movie town. If you don’t live there it’s hard to believe but it really is a very intense business with writers and directors and producers. On the other hand the exhibition business. So I talked a little bit about content creation of movies, the exhibition business is also a tight business in which everybody knows everybody. So by having one marketing maven who was a former exhibitor we were able to reach the major distribution chains. So for Monster House we had I think about 235 theaters, and that was about 4 or 5 months ago, in 12 countries for, that was a Sony Imageworks release. For “Meet the Robinsons” which is a Disney movie in March 30th, we’ll have about 500 theaters. We’re installing more and more theaters, this is essentially theaters with the Zcreen modulators with special silver screens. I wonder how many people have seen recent 3D movies in a REAL D theater. [pause] So, the way the movie looks in the theater you went to looks just the way it does in our screening room, it’s uniformly good. So we hear really good reports and the system doesn’t break down. But what the studio people want from a 3D movie, the people who are into the exhibition end of it, they want an experience that is different that what you’ve got in the home because theater attendance for the past several years, up until this year, was falling off. The motion picture business is a cyclical business. Sometimes it just depends on how good the movies are. On the other hand in order to differentiate what they’ve done in order to bring people to the movies stereo is very good. 3D movies do 3 times the box office than the 2D version of the movie. They do very, very well. That was a decisive argument for the studio heads and that’s why there’s a lot of stereoscopic production from Paramount and Fox and all the major studios except I think Universal. But those companies also want to be able to release those movies in the home because they make half of their revenue from the DVD sales. So it’s a paradox because on the one hand they want to be able to get people into the theaters with a unique experience and on the other hand that uniqueness will evaporate once stereoscopic television is ubiquitous but it will take many, many years for that to occur because it’s a gigantic infrastructure problem. Unlike what REAL D has been able to accomplish in the theatrical film industry in one town, in Los Angeles, was relatively easy if you’ve got the right connections and know the right people. Making the television infrastructure, the cable operators, the broadcast people, the producers the set manufacturers, the people who make the cameras, in order to have that happen that is going to be an enormous problem or challenge to put a positive spin on it. So, you know having said that I’d like to hear from my fellow panelists or audience members have any opinions. I’ve sort of looked at it from a marketing point of view and an infrastructure point of view rather than a technology point of view. Because I agree with what Steve said I think the technology may not be the issue in the long run. But it’s going to take a lot of effort to get disparate groups to cooperate. So any comments or have I said the final word? Audience: Lutz Moehr (LM): I have a question on that point that I think is very important, the content count. I also think content is the most important thing. But unfortunately 3D content from the past is not available today in a big approach as stereo format and DVD format. In the IMAX case or other technology I think out of over 30 publications or productions we have just how many in 3D available, I think maybe 10 or less, I’m not sure? How will it be with this new production? You said the big producers would like to make it available principally for home. What will be first? Availability of the content to be played in 3D also at home or the hardware, it’s a chicken and egg. SS: Let me try to answer some of that. I think that in one case, this is why I brought up the CG content, and again Lenny, you outlined it really well, it’s a small captured paradigm, you could fit all the solutions to their problems. But when you take a look at trying to get television content and that goes all the way from news broadcast to a young production company that wants to produce some hip series you have to solve a whole bunch of other stuff which, just briefly would be like working with companies like NVIDIA, who gratefully joined as a sponsor here, getting the correct drivers for the graphics cards, working with people like Adobe and Apple to have the appropriate plug-ins for Final Cut Pro and Adobe Premiere so that there’s an editing phase for these people. Not even having addressed the fact that where does some young director or producer go to learn about stereo and understand it in the context of today’s equipment? And then you have another really crucial infrastructure. There’s been a lot of talk here, because this is on the display side, there’s a lot of weight, we’re trying to solve the display side. But there’s hardware related to equipment and synchronization and data capture that’s on the camera side and companies like Lightspeed Design, 21st Century, Cobalt, these are companies that are trying to build rigs. So as you can see it’s a pretty big soup of ingredients that we have to find the right mix and then make it workable for that adopter to say “Yeah” I can do 3D and I want to take something on. MF: I think to add to that as well, a crucial thing to make television work is going to be some level of standardization. NTSC originated in 1941, there weren’t really very many televisions at all around then. The only modification to the NTSC standard came in 1951 and that added color as a very small modification. In 1951 there was nothing being broadcast in color. That didn’t happen until 1954 and there really weren’t any TVs available for several years after that. Same with ATSC that HDTV standards, its standard was created years before the televisions were created, let alone all the things Steve just mentioned. But with 3D television unless it piggybacks onto the existing standards we haven’t even gone to that point, we have to create some standards for broadcasting television in 3D but before we can move to thinking about putting 3D in the home. LL: So Brett I can feel that you want to speak. BB: I do. I want to refer to the HDTV experience and kind of build on what Steve was talking about but maybe just go up one level. There is a chicken and egg problem and it’s a three-way fight, or has been a three-way fight in HDTV between broadcaster, between the people who provide the studios who make the content and provide the content and then the company’s who provide the hardware. The broadcasters they don’t want to change anything that they’re doing, I mean they don’t want to buy new equipment because, they say, okay there’s no hardware out there, there’s no content for me to broadcast so why am I going to go off and spend all this money to broadcast. It’s not out there. The studio content people are arguing that there’s no hardware and that there’s no mechanism to broadcast so they don’t want to spend their money and then the hardware guys are saying well, I am not going to, I am not going to make consumers, I am not going to spend my own money to develop the technology and make consumers buy extra hardware when there’s nothing for them to watch. So that’s been the classic HDTV situation and then to kind of build on what Mark said, yes there does need to be standards but, what happened in the US was the government had to get involved and say, you know we want this to happen and it has to happen by this particular time frame, yeah we need standards, we need everybody to play here but we’re going to set a timeline and this is when it’s going to get implemented and that’s when it’s going to happen. Just having standards and just having the technology is one piece of it but you know, to be honest with you, you know, I think the government’s going to have to get involved at some point and industries are going to have to convince the government that it is, when is the right point to actually set up a timeline for that. LL: Well, I could tell Art, that you’d like to speak next. I can tell by your body language, you waved at me, so go ahead. AB: I guess I’d like to suggest a scenario the chicken and egg phenomenon, I believe here is very real. Content will appear when people will have displays in their home but they won’t have displays in their home until there is content. But in the absence of government taking the action to include 3D in the broadcast protocols, it will be consumer-demand that drives the industry to put 3D televisions in the home and the scenario I see is that the products that people will encounter first with 3D are likely to be cell phones and advertising, when they become familiar with that they’ll want it at home and then the consumer demand will occur and then the industry will respond and then the in the third place the government will come and do something about it. LL: And then that’s interesting, making short term predictions is very, very difficult and if we’d tried to understand what patterns may occur in the future based on the past, Mark talked about introduction of NTSC television, it took twenty years after the introduction of NTSC television to achieve about a 50% market penetration. RCA and its licensees spent billions of dollars in today’s dollars to achieve that and it took many years after that for color television to be fairly decent in quality, so I just wonder whether or not we are going to see a decades long introduction of stereoscopic television. However, we live in a different universe because when NTSC television, color television was introduced, it really was, only a VHF, there was a Very High Frequency broadcast, there wasn’t anything else. There were no cassette tapes, there were no DVDs, you didn’t have 200 cable channels and you didn’t have Play Stations that could plug into the TV, so stereoscopic television could enter, in a way, through the back door, through anyone of these mediums and rather than through broadcast television, per se. LL: So, Julien, we are ready for your question. Audience: Julian Flack (JF): My name is Julian Flack and I am from DDD. I’d certainly agree that the infrastructure requirements for introducing 3D TV are enormous and I can see that that would be a long timeframe. But the question that I have for the panel is do you think it’s possible that technologies like DVD distribution or internet distribution that you can’t really discounted in this day and age, can, kind of kick-start that industry and solve the chicken and egg situation, so if for example, the content producers that spend a lot of money on creating and converting 3D content wanted to see another outlet for this, on say, DVD or through some sort of internet infrastructure, do you think it’s possible that that could sort circuit some of these standards and get to the industry before, you know, the TV standards, the broadcast standards have to be laid down. I.E. is there a possibility that this thing could happen short of a really long timeframe we’re talking about at the moment. LL: I think that’s interesting, who’d like to, Steve? SS: Well, let me, I think that’s a really good question and I think part of this solution is how to solve the value proposition for those people to provide it. How do you get the motivation so I think, you know first off we have an interesting issue and REAL D and the cinema people that have invested in 3D and there very high end theatrical experience, you know, may take a while for them to be compelled to say provide that content at the home level because they are making a strong case for keeping theatrical 3D you know, some reason that you’re going to get out of your home and go to the cinema but I believe that’s an important part of the equation, getting that content onto stereoscopically encoded HD DVD and Blu-ray DVDs, gaming again you look at back-dooring it like Julian brought up and getting these early adopters to say look, here’s a number of different technologies that exist in the display, let me go ahead and put together a 3D game and DVD system that will help solve the value proposition for the content developers and streamers like cable. LL: Well let me ask you a question. I think that everyone of the display technologies that’s available, rear projection television, plasma panels or liquid crystal flat panels, all of those are capable, one way or another of producing stereoscopic images, do you think that the public will accept, the stereoscopic television with eyewear as selection devices or as Philips believes will it be an auto-stereoscopic system that will prevail? SS: That’s a good question and I think people are putting out solutions to see what the adoption is. You know when, my feeling is that, get to a short answer. When auto-stereoscopic solutions can be full high-definition, the answer is a no-brainer, that’s the way to go. I still feel that when and again I maybe, I have a vested position in part of this but high-definition is an important part of my viewing experience, either in a movie or in a game, to sort of drop back to 250 pixels, I am not too excited about though. LL: Right now, individual selection devices have a tremendous technical edge, they provide a better image but they may be less desirable in the long run, do you think there could be a progression? We could start with systems that use eye-wear and then evolve to systems that didn’t require eye-wear? SS: See, what my feeling is, yes. I think there could be a slope that allows for adoption and I think, just like the solution was kind of being worked out right now with HD DVD and Blu-ray, you get competing systems out there and infrastructure, if you’ve got the streaming and the content can do decoding on back end side so it isn’t really relegated to which system you have, what 3D experience you’re going to get, you can let the consumer choose in the end what’s the best system for them. AB: I, I absolutely think, yes, I mean, just looking at the audience, most of us are wearing glasses and I can just don’t think it’s all that obtrusive for us to switch glasses. I also think that maybe there’s a different usage model to some extent getting to Julian’s point, you know a guy who is focused on playing a game in 3D is probably much more conscious about putting on a pair of glasses than somebody who is lying down with a beer on their couch watching television and so I think maybe there’s an intermediate good step at not just in the home, not just on wearing glasses but on how we use stereoscopic displays in the home. LL: But it’s also a question, I think it was raised at what the market place can absorb. I think Art raised that issue. For many years, in fact decades, televisions were 3 or 400 dollar devices that would last for you know 10 or 15 years. Now in the past few years people are buying 1000 and 2000 dollar television sets. So the market has gone through incredible convolutions, it’s an enormous change, but could it stand another one at stereoscopic television is introduced, while we are only part way through the introduction of High-def. BB: Well, people aren’t going to buy a second TV to watch 3D. So it has to be there primary television that provides the 3D experience. Now, I believe, they certainly can expect a degree of penetration from 3D systems that have eyewear, specially, if it allows eyewear to be added to existing TVs. DLP and Liquid Crystal TVs for example but my take on the situation is, is that that will be a relatively smaller win. The big win where every single person has one in their house will be when it’s auto-stereoscopic and that the quality of the 3D image allows you to watch TV with the same degree of convenience and comfort as the underlying 2Ds displays we see today. BB: I have a couple of things, since we covered a lot of ground since Julian stood up and, I want to go back to my, four places where 3D will be in the home. Okay. In your pocket, in your office, in your home theatre, if you have one, in your living room and I do believe that the introduction of 3D content in your home is most likely to come through things that are going to be in your pocket and maybe in your office, as far as, glasses go, again I’ll go back to my four areas, in your pocket, most likely a single user, you’re going to pick it up, you’re going to look at it, you’re not going to put on your glasses, your going to want to look at it and put it back in your pocket and maybe look at it for a little while. So I don’t believe glasses are going to be the first choice in that kind of scenario but also from a technology standpoint, things that you put in your pocket have fairly high turnover rates, you know, you might buy a new cell phone every year. You’re not going to buy a new TV every year, in your office again it’s most likely going to be a single user. I don’t see glasses as a major problem when you’re sitting in your office, you’re used to grabbing your mouse, you’re used to typing on a keyboard, you’re used to doing different things than you’re used to do when you are in your living room. So I don’t see putting on a pair of glasses in your office is going to be that big a deal. In your office you’re likely to get IP TV, you might get the content over the internet, you’re probably going to get introduction of some 3D material in your office before it comes into your living room. In your home theatre, again, that’s an event type of atmosphere. Families go in there, it’s multi-user, families go in there. They eat popcorn, they watch a movie for a couple of hours, they put on their glasses, they sit back and they laugh and they enjoy the movie and they get up and they go to bed. So glasses, I don’t see as a major problem in home theatre but again, the home theatre that’s not the type of turn-over that you have in your pocket. Home theatre systems are bought but once every ten years. In your living room, in your TV, you know I have to, agree with Art, that again is a, is a multi-user experience, people come, flop down on the TV, the whole family sits around and watches and they get up and go away. In the TV industry, the average viewing time per day is six hours per day, so that’s about 2000 hours per year. That’s how people you graded their television life. I don’t watch six-hours TV a day but maybe some people do and they’re not going to sit around with their glasses on for six hours a day. There’s also in the industry, something that’s known as wife acceptance factor which I am sure you probably all heard and whether it’s perceived or whether it’s real or not, I would throw out there that the wife is not going to want to sit around watching the rest of the family wearing a pair of glasses and she’s not going to wear them herself. So how the wife acceptance factor plays in 3D is a little bit unknown right now, but I’d agree with Art, I can’t see the living room, the TV system with a pair of glasses but I do see glasses being acceptable in other places in the home. LL: This is very interesting. You know making, as I’ve said making short-term predictions is about the technology introduction is very difficult but one thing I am sure that anything that we predicted today will not come to pass. It’s all going to come out some other way and it’s interesting because digital television is government-mandated and I guess, in a year or so, analog broadcasters are supposed to end and peoples’ TVs are going to be obsolete. That’d be very interesting to see if the guys in Congress can get re-elected with a plan like that. But, I don’t see the government mandating stereoscopic television, you’ve got to have stereoscopic television, it sounds funny, almost an amusing idea. And I don’t know, I just don’t know about people wearing glasses, or not wearing glasses, you know, I’ve been involved in the design of eyewear for many years and it’s something you wear on your face, you care about how you look and it’s got very difficult ergonomics, people want to be comfortable, so I had up until recently thought that the stereoscopic displays in the home would not connect with the public if eyewear were required. Lately I changed my mind. I think maybe early adopter systems in home-theatres that could happen, but we’ll see. We have a question here. Audience: Robert-Paul Berretty (RB): My name is Robert-Paul Berretty and I am from Philips Research so representing Philips that was discussed during the panel already and I’ve a question related to a display, say the different types of displays that you could have in your home and indeed we envision that an auto-stereoscopic solution is something that consumers would like in their living room although we don’t rule out other solutions of course, but I think there’s a question that I would like to pose to the panel that’s related to content. I think if you talk about, say multi-view displays and say content is, the channel for content maybe a bit different than for stereo, so Lenny already pointed out, if you shoot a movie for IMAX theatre then you can reasonably well view it on the stereo pair but for multi-view there’s also another challenge to see how you are going to generate those multiple images and in our labs and in the digital slides area we have very good experience with the so called image and depth format which is slightly different say from doing it stereoscopic recording and we believe that this is feasible solution for consumer use in the home and it’s also I’d say compatible with some of the 2D to 3D conversion techniques that you might want to do in post production. We’re working on a standard that is going to be evolving in MPEG to which actually make image and depth standards, so we are trying to get things installed there but I want to [ask] what the panel’s view is on this format issue? LL: Well, let me ask you the question since you are standing and talking. What do you view the time-table for the introduction of the Philips technology in the home? Audience RB: So there are two things, so in order to break the image of the chicken and egg problem, you could think of a scenario where you install a stereoscopic display in the home but you need to do some kind of say 2D to 3D conversion in the set to be able to say, enjoy 3D from the broadcasters that are out there and that could happen very fast and so in the past our CE department have said that it could be 2008 that 3D television hits the markets. It’s not been announced but it could be very fast. LL: Do you think people would be happy to sit around with a 3D television in their home most of the time? For the first few years it wouldn’t function in 3D, you’d get good planar images, every now and then you’d get a 3D show, would people be happy with that? Audience RB: I feel, I clearly believe so, yeah, yeah. But I think it also comes with say those early adopters that would, use this display for gaming for instance and other applications that are really 3D. That’s why we need to get the markets used to 3D and we have to make it beautiful so we are working on a way on building end to end systems to make that first step when we truly hope that people will enjoy it. LL: I am very impressed because I think Philips is the only company in the world that is working on an end to end solution. You’re looking the format, you’re looking at how the content is created, how it’s distributed and the display device itself, and I don’t know if anybody else is doing that, do you? Audience RB: We believe that it is the way to do it and we are trying to get other people to join us here. LL: Right so you’re, Philips is a licensing company to a large extent so your strategy would involve getting other people to signup. AB: I think going back to my comments on standards, it can’t just be Phillips, we need Sony and Toshiba and all sorts of consumer electronics companies cooperating with you and pushing things through MPEG or whatever the standards group is because Phillips is not going to make a standard here, it’s got to be an international thing. LL: You know that RCA created the NTSC group to give the imprimatur of a standards body and you know Phillips may need to do something like that. I know in Japan they have created this 3-D Consortium, possibly for a similar purpose, but it’s unclear now whether their goals and objectives will be met or even what they are. SS: I was just wanting to add that we are seeing more of the silicon guys and there’s some software people or Intel has been around here this week and new guys I want to laud you guys for continuing to come at the problem and add to the end to end part of the solution, but in getting to what Art was saying, if we want 3D to be basically structured in the next gen. television format specifications we got to make compelling case for people to want to get there and that is why I think intermediate implementation, you know gradual step up. LL: It is a formidable problem, you can even ask yourself whether or not people will want stereoscopic television at home. I lived through a transition in computer graphics that some people may remember 25 years ago was questioning whether or not color computer graphics were required and it was the seriously debated and people wrote papers on the subject, but I think the decisive factor was that people can go home and watch a color television show. If you can have a color TV at home why couldn’t you have a computer that output color, and now I think with the proliferation of stereoscopic cinemas and more content, I think people will be educated to the possibilities of the stereoscopic cinema. I think a very good step in the right direction took place about 20 years ago when theme parks began to adopt the stereoscopic cinema as a special venue in their locations. So I think you know progress is being made, but it may take a long time before we get significant penetration. Anybody have any comments, you know we welcome more comments from the folks here and I see somebody coming up racing up to the man in purple. Audience: Walter Funk (WF): My name is Walter Funk and I am involved with using autostereoscopic displays and volumetric displays and the sense of a performance art performing live, so I have had some experience with multi-view displays in real–world situations and one thing that I came across, which we will all take consideration with multi-view displays is that, it’s going to be different for a personal form of entertainment such as a video game as opposed to a passive form of entertainment as a movie where we have a person sitting on a couch and have their view here and they have someone else sitting there. You know you are not going to get one person all of a sudden running across this side, the mother here and the father there and clashing each other in a room, you might get that in a sense with the video game, we have one person going back and forth with the horizontal and vertical parallax so for a content provider that’s getting an issue too imagine a film maker, they have a regular stereo movie, they can put you right in a very specific seat and very specific place, which is very useful tool for a film maker, but all of a sudden we have all these multi-views that opens up whole new realm for creative producers for a movie maker. LL: Right, I guess it would depend on where you were sitting in you room you’d see the film maker might not be able to completely control the shot. LL: Now when working now with film makers who are wrestling with the issues involved in making stereoscopic movies, its very interesting to see these smart guys figuring out how to do it, so it’s kind of fun. We have some people here, who, you know we mentioned gaming and there were some folks in the room from NVIDIA who I’d like to hear from, you know, I don’t know, Dave Cook is here or some other guys from NVIDIA, you know I’d love to here some comments from you along the way whether or not you think that, we’re going to have stereoscopic games in the homes sooner rather than later and also you’ve got some experience with stereoscopic games on CRTs in the past so if you’d volunteer to come on up, I’d like to hear what you have to say. We have another gentleman here. Sir, would you introduce yourself. Audience: Chris Chinnock (CC): Okay, I am Chris Chinnock, I am with Insight Media. I have a question about actually the broadcasters, we’ve talked a little bit about how content might come into the home via DVD or Blu-ray or IPTV and I think there’s a, perhaps a question about the broadcaster over the air broadcast part of this. Do you, I am asking the panel, have an opinion on whether the broadcasters will be absolutely obsolete and dinosaurs in the 3D era or is this a way for them to play and get relevant again? LL: Does somebody want to take that? You say the implication is that the broadcasters are now irrelevant? Audience CC: Well, my, I guess is I wonder whether the over-the-air transmission of broadcaster 3D is going to be the delivery medium for 3D? LL: Yeah we have many choices which we did not have in the past. There were many ways you can use your television set to look at stereoscopic content and I don’t know the answer, it’s very hard to know. AB: I’d like to take your question in certain sense expand it. You are asking how will the broadcast people make money when the 3D becomes prevalent. I think it’s a worthwhile question to ask, how all players make money on 3D. That’s what drive it, that’s the engine that ultimately will make 3D proliferate into every ones homes, how will advertisers be able to use 3D to make more money than they do? LL: You are forgetting about the audience, I don’t know how the audiences going to make out in this equation. Is the audience going to make money? Or spend it? AB: Well it depends on what the advertisers tell them, I guess. SS: Just maybe a brief comment, I mean a number of high end people that are invested maybe in other methods of delivery have kind of started to forecast the end of quote-un-quote broadcast television, so broadcast television has a really serious set of questions that they have to try to ask themselves, how are they going to participate in the media distribution system that’s coming available. Perhaps 3D’s a big part of that, could it be, but I kind of feels it’s not going to be the compelling reason I think they have join to join the rest of the delivery process and see what’s relevant. LL: Yeah right now you have only a handful of High Def channels being broadcast in any community you can only get half a dozen or maybe a few more and to ask the broadcasters now to endure another transition which will be costly is probably an improbable event until you reach a certain level of acceptance with regard to High Def or digital television. So it may well be that broadcast television is not the avenue or the vehicle for stereoscopic images in the home, it may well be that gaming is the vehicle or the television or rather the movies that are being produced for REAL D cinemas and IMAX cinemas that may be available on Blu Rays or HD DVDs. That may be the way it will enter, but I can’t believe the broadcasters will be the first to adopt it simply for economic reasons because they’re enduring a transition now, that’s very costly. So we have our next speaker or audience member. Audience: Scott Vouri (SV): My name is Scott Vouri with nVIDIA and I agree with you a hundred percent the real issue is, is stereoscopic technology a compelling experience for consumers, we can provide all kinds of hardware and software but unless we deliver something that is truly unique and compelling people aren’t going to buy it and if we do they will pay an enormous amount of money for I think if you look at the HDTV revolution, I market our Blu-ray and HD DVD technology as well as stereoscopic, you’ll see that what really drove it was when all of those sports fanatics could start seeing the blades of grass on the field or the tennis ball that was it, it wasn’t, it truly was the detail was a unique compelling experience above what they got with NTSC and I don’t think that we are going to deliver that with over the air broadcast at first. There’s two-ways so far that we have been talking about are really unique value add over what the current experience is and one of them is 3D gaming and so obviously you know kind of self-serving what we are very interested in seeing that take off in the home and the other is the 3D movies on REAL D cinema screens is quite a compelling experience. I think so, there is the two avenues that we’ve got to a figure out how to the bring that into the home in a standardized and at a compelling price point and that’s where it’s going to go and once we can prove to consumers that this is not a flash in the pan, this is not old 1955 with geeky glasses then there’ll be enough demand to bring broadcasters on board. LL: Let me ask you a question Scott. I’ve lived through NVIDIA offering drivers, and Jeff Fergason at i-O Display offering eye-wear, and other people offering eye-wear, and when this happened, I don’t know, 7/8 years ago there were CRT televisions with monitors, computer monitors that could play stereoscopic images beautifully. Why didn’t it connect then and what’s different now? Audience SV: Well the advance in geometry processing in 3D games since that time has been phenomenal and so the experience of a 3D game that a 3D gamer receives right now from watching a stereoscopic game is much better than back then. In addition we kind of alluded to some new technologies that are coming out so the unique thing about CRTs was off-course that they had the speed and as CRTs have dwindled, the solutions haven’t been there for gamers to transfer that demand and with the advancement in the authoring a 3D game where they are not taking short cuts, they’re using the true depth information, even for the leaves of the tree in the background, the experience is much more compelling than it was back then. LL: I think you could make a good argument that stereoscopic displays would enter the home in gaming, for gaming. But we’ll see and I don’t really care, which way it enters, I’d like to see stereoscopic displays in the home, I am a partisan, so we’ll see how it turns out, does the panel have any comments? Audience SV: Yeah, I’d like to say one more thing, [then] I will sit down. We’re very interested in, seeing a standard evolve for delivering the great Hollywood content into the home and any body that to wants to work with us to do that I’d be willing to talk to them after the panel. LL: Okay we have, Jason Goodman, who is a stereoscopic cinematographer. Audience: Jason Goodman (JG): The one thing that I wanted to add also is that you know gaming platforms like Play Station 3, and Xbox are way beyond just video games now, those systems now come with sort of memberships to online communities that allow you to download movies and things like that, and so, I really agree with what everyone is saying is that although standards are needed its interesting to see how as technology has improved the more advanced devices are able to adapt to multiple standards, Blu-ray Discs and HD DVDs use multiple different compression standard to deliver the same content on an Apple computer or on a PC or a Windows computer. You basically can run quick time and AVI and all these different types of MPEG formats, so there’s a lot more flexibility than it was necessarily in the 1950s when you had to have certain format or the TV just wouldn’t work. I tend to agree that 3D can kind of just sneak in there through one of these platforms and you know the other interesting thing that I’d find about the gaming platform is that although Play Station, and Xbox and Nintendo are all totally incompatible with one another, they co exist in the market place in a way that formats like VHS, and Betamax were not able to do. So as technology advances it seems to be of the deal with these multiple different standards. LL: And so are you agreeing with Brett who thinks that stereoscopic displays might enter the home in the pocket. Audience JG: Well I think there is a place for that, certainly, well the other point that I wanted to bring up that addresses that is that I feel like there’s been somewhat of an assumption in this conversation that in order for 3D television to succeed everything’s got to be in 3D as you mentioned, there’s really a small percentage of the content even if you own an HD TV there’s a small percentage of the content that you’re actually getting in HD and I personally find myself watching fairly crappy shows that I probably would not watch specifically because they’re in HD. So I think that if 3D TV was offered in a way that enhanced the normal television viewing experience, viewers and obviously the cost has to be within reason. I think viewers would seek out that 3D programming and it’s the kind of thing that would sort of be self propagating and certainly the films that are being enabled by REAL D technology would be a great source of content for that. LL: Okay, well I think we better wrap up now because we only get a couple of minutes until noon and I’d like to give each panelist an opportunity to give some final thoughts and one thing I’d like every body to do if you can to make a prediction about when you think stereoscopic televisions would be in the home and what year? And I’ll start with just sort of a game, like a parlor game, so anyway, let’s start with Steve at the end and work our way towards the moderator in a wave. SS: All right, well again noting your point that predictions are always a dangerous thing and 100% of them generally don’t take place. I think that in 2007 and 2008 you’re going to start to see systems becoming available. I think gaming is going to be the platform I think hand held devices is the other one. I don’t think one has to necessarily occur ahead of the other to drive the other one but I do think there has to be multiple formats. And the last thing I want to kind of add is there needs to be a beginning, of our discussion about issues related to standards and where are the needs that aren’t necessarily resolve, I think the committee, the SD&A is a great place to start, there to try the get these other groups like Apple and Adobe to come in and participate to open their eyes up so we can make the case for the next-gen television. 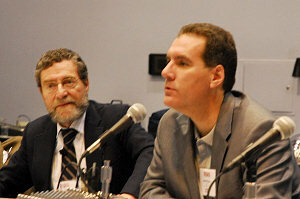 LL: The SMPTE has a body, a part of the DC28 digital cinema group that is discussing standards for stereoscopic cinema. It’s possible the SMPTE could be a forum for such discussions so let’s move now to Mark. MF: Yah the conversation today relieves me a little bit because I think 3D will end up in my home but it won’t be through television, at least as we traditionally define it. I do see 3D entering the home probably through gaming than maybe through hand held sort of devices and the comments that Jason made just a moment ago I thought were fascinating, that we have much more flexibility in terms of handling different technologies and different standards if you will, today than we did years ago and so there is an opportunity to bring 3D into the home even if there is a lot of incompatibility in the market place and so that’s I think really encouraging, answer to Lenny’s question. My home I’ll say 2010. LL: Ha, ha! Okay, Art. AB: I guess I’d like to offer a variety of comments in answer to question. First is I always grew up loving science fiction and the future was always represented by a hang-on-the-wall television that presented in 3D. We’ve got half of that, I just came wait for the other half. Having said that, I guess my feeling is that its not sooner, its later. I think that the existing televisions are not that great in 3D to replace 2D television so the they got to be able to switch, however I think that the path to make 3D televisions as good as they need to be so that every one will want one is there. In the case of the auto-stereoscopic displays, I think the prospects of making wider field of views and more views so that the images are pleasing for all of the audience. I think that the path is there and that it’ll happen but I put it more at 5 to 10 years. BB: I have agree with the panel that 3D content is going to make its way into the home through other means than your TV in your living room. It is going to come in through mobile, through your computer monitor. Consumers are going to want to see and evaluate and be convinced in the 3D contents before they’re going to invest the money in a 55 inch TV to put it into their living room. That’s just the way it is. So I do expect 3D content to be making it’s way into the home but for me personally having a 3D TV in the living room where you are watching prime-time broadcast with 3D effects, things are just not there, the contents not there, the transmission technology is not there, even the human factor issues haven’t been worked out completely yet. The display technology probably isn’t even there yet, so you know we are talking, optimistically 20 years from now may be prime-time TVs will be shown on TVs in some living rooms but in the living room TV is quite a long way away in my opinion. LL: Well, I am optimistic and I’ll explain why. I’ve been a subscriber of Popular Science since I was a little boy and they haven’t predicted stereoscopic television in the home and whenever Popular Science makes a prediction or features an invention or discovery, you know it’s doomed. It will either never appear or you’d be a very old man before it appears so since they haven’t singled out stereoscopic television as something that will be available to the consumer, I feel confident that we will have the stereoscopic television this year. Ha, ha. Okay thanks, I want to say thanks to every body. Many thanks goes to Dave Cook for preparing this transcript. This event was video recorded and will be made available at some point.